Huge rain showerhead, flexible hand spray with stainless steel hose and massage jets. Body adopts stainless steel material, having strong capacity to resist corrosion, no rust, no lead container. Offers you delightful bath and wonderful experience. Slimline design adds style and ambiance to your bath decor. With 5 modes of massage function. 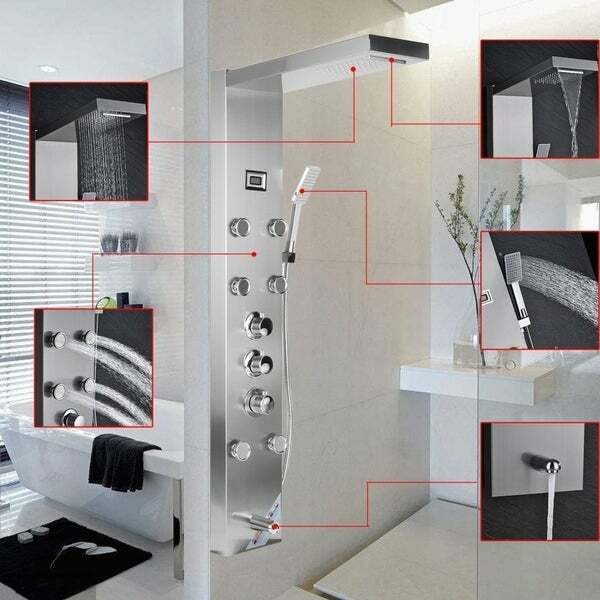 Thermostatic control with LED display. Dimensions 50.79 In. X 10.24 In. X 8.67 In. The Thermostatic Shower Panel Tower w LED Display WAterfall Massage System was very complicated to install. It requires a lot of technical skills to assemble, mount and install it into a shower. You really need to access the plumbing inside the wall. You can not just connect it to external fixtures. It would be cool if it was easier to hook the thing up. The stainless steel was very nice as was the design of it. This shower panel is nice. Mines arrived damaged and overstock sent out an replacement without hesitation. The unit is sleek, modern and Rare find. Amazing! Easy to put together, well made! "My husband is 6'5 will it be high enough?" This product is approximately 4 feet in length. The length of the product is fixed, but the height of the installation can be adjusted. "Do we need power supply or it is uses battery for LED display"
"Do you need electric connection for LED light or it is battery operated"
"Is this always in Cel or can it be changed to Fer for temperatures? If so , how?" "is it the temperature adjustable, or is it set at 38 Â°C unchangeable?" The temperature is adjustable, but the minimum temperature is 38 degrees Celsius. "What are the measurements of the overhead piece of this shower?" The overhead piece is approximately 19.5 inches x 8 inches.